A man has appeared in a South African court in connection with vandalising a statue of Mahatma Gandhi. 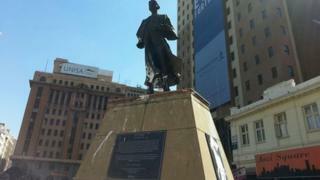 "He was found while painting the statue with white paint and arrested," police spokesman Kay Makhubele told the BBC. He was part of a group who demonstrated near the statue on Saturday with placards reading: "Racist Gandhi must fall". This is the latest in a series of protests in South Africa calling for the removal of historic statues. While the man who led India to independence is widely regarded a man who stood for peace, some South Africans have accused Gandhi of working with the British colonial government to promote racial segregation. He lived in South Africa for 20 years and campaigned for the rights of Indian people there. The rest of the South African protesters, who managed to escape, wore caps with the governing African National Congress (ANC) but the party has distanced itself from the incident and condemned the defacing of the statue. The suspect Molese Maile, 21, was ordered to return to court on 8 May to answer to the charge of malicious damage to property. The hashtag #Ghandimustfall (sic) is being circulated on social media in South Africa. Twitter users are quoting articles reporting that as leader of the Natal Indian Congress, he said that Indians were superior to black people and petitioned the colonial government to have a separate entrance for them at the Durban Post office, where they had previously used the entrance reserved for black people. Last week, a statue of British colonialist Cecil John Rhodes was removed from the University of Cape Town, following protests by students there.